Autumn came suddenly this year, and after all the heat it’s nice to finally be in sweater weather! 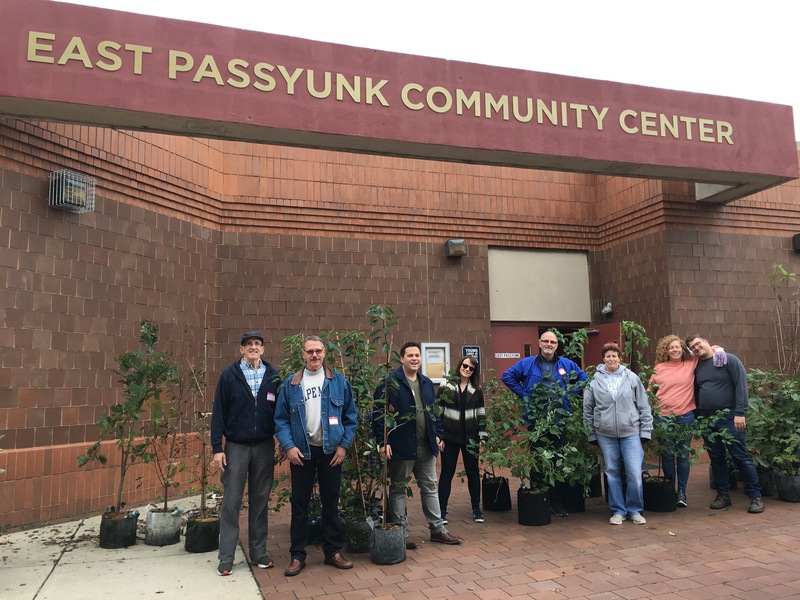 Fall is one of our busiest seasons in East Passyunk Crossing – we’ve already hosted a number of events but there’s still more in store, including our fall neighborhood cleanup and our fall street tree planting. Read up on what work our committees are doing, and please join in on our upcoming events! Board elections are fast approaching. If you have attended three General Meetings this year, you are both eligible to vote for and run for the 2019 EPX Board. You should have recently received an email from our Elections Committee Chair if you are eligible to vote and/or if you are eligible to be nominated – if you haven’t, please reach out to contact@epcrossing.org. The next EPX General Meeting will be Monday, November 5th at 7PM at the East Passyunk Community Center at 1025 Mifflin Street. The meeting will feature presentations by Prevention Point and the Philadelphia Police Department – 3rd District about the important work they’re doing in our community. Our Beautification Committee has been busy! October saw a successful yard tree give away, with nearly 60 trees finding new homes in the city. This Saturday, November 3rd will be our Fall Street Clean Up. We’ll be cleaning 7th Street, from Snyder to Tasker. Meet at the EPX Community Garden (on Watkins Street between 10th and 11th Streets) for coffee and pastries at 9:30am, and we’ll hand out supplies and then head to 7th Street as a group. Our Fall Street Tree Planting will be Saturday, November 17th and we would love to have your help! Meet at 9:30am at the EPX Community Garden for training and refreshments, then join a team of tree tenders in greening our neighborhood. If you are interested in having a FREE street tree in front of your home, the deadline for the spring tree planting is November 27th – please submit an application here. The next Beautification meeting is Thursday, November 8th at 7:30pm at the East Passyunk Community Center. We hope to see you there! Are you in the Southwark catchment? Southwark Elementary hosts open houses for prospective parents every third Thursday at 9am. Meet at the main office for a tour of the school and to speak to the principal and community school liaison. The School Advisory Council meeting is Monday, November 5th at 8:45AM in the Auditorium. October saw the unveiling of the new front community space, featuring seating and planters constructed by community members supported by Mural Arts and Basurama. Friends of Southwark / EPX Education’s next meeting is Tuesday, November 20th at 7pm at the East Passyunk Community Center.Events:Our online auction is fast approaching. Look to support your civic while also bidding on unique experiences at local businesses. Featuring items that will make one-of-a-kind holiday gifts, experiences, or personal indulgence. Proceeds will directly benefit the civic and allow us to fund our outreach events and neighborhood initiatives. The auction will begin Small Business Saturday November 24th and will end Sunday December 9th. November General Membership Meeting – Monday, November 5, 7:00pm at the East Passyunk Community Center at 1025 Mifflin Street. Fall Clean Up – Saturday, November 3rd, 9:30am. Meet at the EPX Community Garden (on Watkins St. between 10th & 11th Streets) and then we’ll head over to 7th Street. Fall Street Tree Planting – Saturday, November 17th, 9:30am. Meet at the EPX Community Garden (on Watkins St. between 10th & 11th Streets) and then we’ll head out to plant street trees in the neighborhood! Education – Tuesday November 20th, 7pm. Zoning – Wednesday November 15th at 7pm. Beautification – Thursday November 8th at 7:30pm. Posted in general membership meeting, meeting announcements. The EPX June 2016 General Membership Meeting will be held on Monday, June 6 at 7:00 p.m. 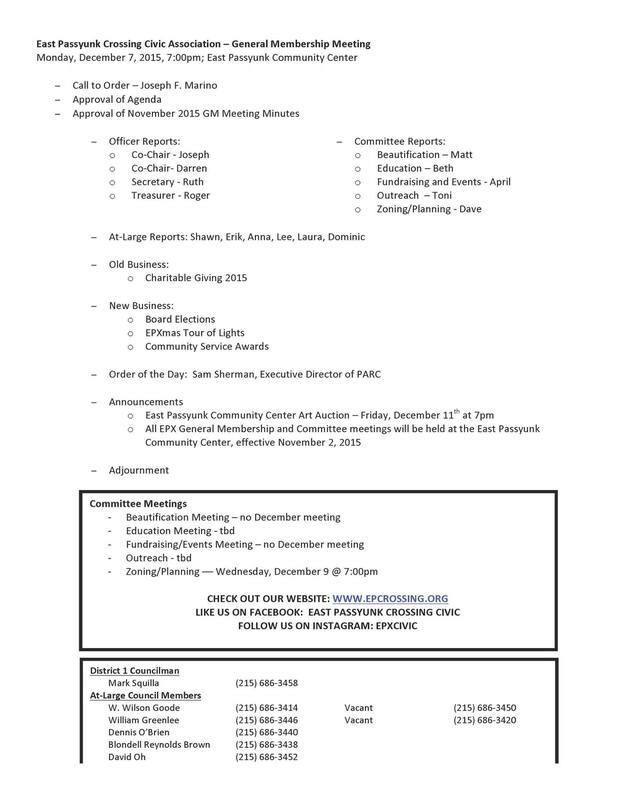 The meeting will take place at the East Passyunk Community Center 1025 Mifflin Street. Posted in eventcalendar, general membership meeting. The May 2016 EPX General Membership Meeting will be help on May 2, 2016 at 7PM. The meeting will take place at the East Passyunk Community Center at 1025 Mifflin Street. The April 2016 General Membership Meeting will be held on Monday, April 4th at 7PM. The meeting will take place at the East Passyunk Community Center at 1025 Mifflin Street. o Don’t forget! Come out to the Italian Red Gravy Cook-off this Sunday, April 10th from 4pm-6pm. The March 2016 General Membership Meeting will be held on Monday, March 7th at 7PM. The meeting will take place at the East Passyunk Community Center at 1025 Mifflin Street. The February 2016 EPX General Membership Meeting will be held on Monday, February 1st at 7PM. The meeting will held at the East Passyunk Community Center (1025 Mifflin Street). Girl Scout Cookies for sale! !